Cheeky, inquisitive and mischievous it's no wonder they are our most popular Conure. They are true soft feather companions so cuddling and bonding are always on the to-do list. Relatively long-lived for their size, easy to train and have no significant health problems, not to mention they are available in a variety of mutations. We recommend them for people with some bird handling experience, at around a year old they will start to test their boundaries and can become nippy. Proper training, a good routine and socialisation will help make this time a little earlier for you and the Conure. If your looking for a "fun" bird, you have found your match! Cheeky is their middle name, they must be supervised at all times, they are brave and will not hesitate to explore every nook of your home. They form strong bonds with their owners, socialisation with other birds, people and pets is important from a young age. Although not know as good talkers they will certainly surprise you. The average lifespan for a Green-cheek Conure is around 10-15 years. They enjoy foraging toys and will spend hours removing every last treat, strong and challenging toys are highly recommended. Not picky eaters they are always eager to try new foods and thrive on a varied diet, nuts and passion-fruit being a firm favourite. An ideal as a second bird and if socialised properly from a young age can be kept with other species of Conures. Fruit Kabob Holder - A fantastic way to hang your Conures favourite fruits and vegetables. Easy to clean and can be hung in hard to reach places for added stimulation. All our birds are offered cuttlebone, mineral blocks, fine grit, egg/ biscuit and the occasional millet spray and nuts. We feed all our birds the Vetafarm brand of pellets. Consumption and waste are easier to manage as they are much cleaner. We have the peace of mind knowing our birds are getting all the necessary vitamins, minerals, amino acids and essential oils. We recommend feeding Conures - Vetafarm Nutriblend Mini, Parrot Essentials and South American Pellets. If you feed a seed diet, ensure the mix is varied, clean and nutritionally balanced. We highly recommend Birdzone Conure Blend. If you want to change a young Conures staple diet (e.g. from seed to pellets), wait at least six months. All Conures should have access to cuttlebone, grit and a mineral block; you can purchase these at any good pet or bird store. If you own a female Conure cuttlebone or a calcium block is essential to avoid egg binding and bone deficiencies. Conures are not fussy when it comes to eating their greens. Celery, Spinach, Kale, Corn, Apple, passionfruit and Chilli are all relished. Buy the biggest most practical cage you can afford, preferably the cage should be new, if second-hand it should be thoroughly disinfected with bird safe cleaner. Good quality cages have stands, metal seed catches and some styles have an open top. The minimum size cage would be 90cm x 50cm. If you buy a cage that comes with smooth dowel or plastic perches, throw them in the bin. Natural wood with varied widths and textures will help exercise the feet and keep toes nails short. Eucalyptus, Bottle-brush and Lillypilly are safe as long as they have not been sprayed with dangerous chemicals. You can also buy readymade mineral perches that are also suitable to use. Do not use sand perches; these will damage your Conure's feet. Cages and cage trays should be cleaned weekly with a bird safe disinfectant. We use and recommend Vetafarm Avicare and F10 disinfectant. Newspaper is fine to use in cage trays. Deciding to clip your Conures wings is entirely up to the situation in which you want to keep it. If the Conure is a teenagers pet or you live in a multi-pet household, clipping would be ideal. Fully flighted they are strong flyers and can easily slip through an open door or window. Never have an inexperienced person or vet clip your Conures wings. Incorrect wing clipping can result in injuries and damaged feathers. Both wings should be clipped but still allow the bird to glide to the ground, not fall directly. We recommend an Avian Vet clip your conures wings. Calcium and natural wood perches should help keep your Conure toenails trim. If not, ask your local vet or pet store to trim them for you. They should be cut in a similar fashion to how you would clip a dog's nails, just enough of the end to avoid cutting the quick. If bleeding occurs simply dip the toe in flour to help stop the bleeding. Conures LOVE a bath. You should offer a shallow bowl of water for your Conure to bath in at least once a week especially in the warmer months. If you cannot accommodate that type of bathing method you can also use a fine mist spray bottle, these can be purchased from most grocery or hardware stores cheaply. NEVER re-use old spray bottles that you have previously used for chemicals. Shower perches are a great way for Conure to bath. They usually have suction cups that can be pushed onto tiles or a shower screen. NEVER leave your Conure unsupervised when using a show perch. Shower perches can be purchased at any good pet or bird store. Conures will chew anything put in their cage, hence Happy Huts are not suitable. Alternatives made from natural untreated seagrass mats are safer. You can buy them with attached toys from any good pet or bird store. Toys are a great way to keep your Conure entertained when you’re not around. Providing foraging toys will also help reduce boredom related behaviour problems like screaming or feather picking.Foraging Toys: In the wild Conure spend hours a day foraging for food, this is a natural behaviour you can replicate by offering toys designed to keep them stimulated for hours. Rotating foraging toys will help keep them guessing, swap foraging toys every week. These DIY bird toys will cost less than the sausage sizzle on the way out. All birds are susceptible to parasites; Conures should be treated every three months with a Mite and Lice Spray. We recommend and use Vetafarm Avian Insect Liquidator. Always spray the Conure on a warm day and ensure you spray under the wings and tail. Vetafarm Avian Insect Liquidator is also safe to use on cages and has an Insect Growth Regulator to prevent mites and lice breeding. Mites and Lice are harmless to humans but an infested Conure may show signs of feather damage or constant irritation, scratching etc. All birds are susceptible to intestinal worms. Conures should be treated every 3 months. We recommend and use Vetafarm Wormout Gel. Common signs your Conure may be affected by worms included a stained/dirty vent or a sharp protruding keel bone. Prevention is better than cure, combining your worming and mite control routine it will ensure you never forget. Including Single Factor (SF), Double Factor (DF) and mutation combinations. See more Green-cheek Mutations here! If you decide a Green-cheek Conure would best suit your lifestyle, it is best to buy one that is hand-raised, meaning they are raised to be tame companions. Choosing the healthiest most active bird is not all you will be looking for, use the guide below to help you through the process. Always ensure they are fully weaned (eating independently, no formula). At least two weeks from weaning is ideal. If you observe the Conures eating in their cage, that is a good sign. 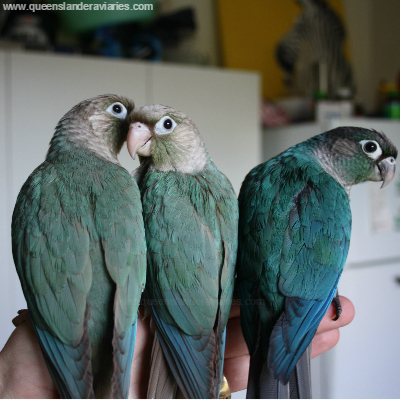 Don’t be tempted to buy a young Conure that is not weaned correctly or too young as it will only end in disaster. Please note: These products are recommended when buying a Green-cheek Conure from Queenslander Aviaries. *Information offered here is to provide guidance and is not intended to be a substitute for the good advice provided by your own avian vet. When in doubt always consult your own veterinarian. Thank-you! Please note we do not spam, sell or share your email address. Advertising - Terms & Conditions - Copyright © Queenslander Aviaries 2016-2019.